Among the topics likely to come up during President Obama’s trip to Mexico is the nature and extent of the two countries’ cooperation in fighting Mexico’s drug-smuggling cartels. Under former President Felipe Calderón, the United States greatly expanded its role in Mexico, primarily through an agreement called the Merida Initiative (which also includes Central American nations). The effort, which has included aircraft, surveillance software and other military equipment, tactical training, intelligence sharing and jointly run operations, has led to the killing or capture of 25 cartel leaders over the past five years. But some have said that disrupting the cartels has led to greatly increased levels of drug-related violence in Mexico; others have criticized the initiative as infringing on Mexican sovereignty — always a sensitive issue where the United States is concerned. 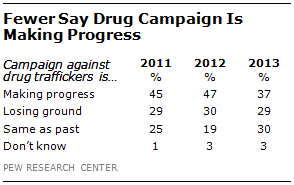 A recent Pew Research Center report, based on a March survey, found that just 37% of Mexicans said the campaign against drug traffickers is making progress, 10 percentage points lower than last year. While the share saying the campaign was losing ground held steady, substantially more Mexicans saw neither progress nor failure. The survey showed strong support for U.S. help in training Mexican police and military personnel (74%) and majority support for the United States supplying Mexico with money and weapons to fight drug traffickers (55%). But though an overwhelming 85% of Mexicans supported using their own army to battle the cartels, barely a third (34%) would support U.S. troops joining the fight. The new administration of President Enrique Peña Nieto, who took office in December, has shifted priorities away from arresting cartel leaders and toward reducing the violence on Mexican streets, according to The Washington Post. Peña Nieto’s government also has moved to centralize authority over the drug war in the Interior Ministry, according to the Post report, and plans to establish a 10,000-member “super police” force, in addition to the existing federal police. While 57% of Mexicans in the Pew Research survey said Peña Nieto was generally having a good influence on the way things are going in the country (the same support level Calderón received when the same question was asked last year), their views on particular issues were more divided. Specifically, 47% said they approved of the way Peña Nieto was dealing with organized crime and drug traffickers, as against 45% who disapproved. And 44% approved of the new president’s handling of corruption, versus 48% who disapproved.